Journal of the House of Lords: Volume 15, 1691-1696. Originally published by His Majesty's Stationery Office, London, 1767-1830. Eastland Merchants, against the Bill to continue the Acts for prohibiting Trade with France, and for Encouragement of Privateers. Small Tithes, for more easy Recovery of, Bill. Epus. Lincoln. Joh'es Sommers Miles, Ds. Custos Magni Sigilli. It is ORDERED, by the Lords Spiritual and Temporal in Parliament assembled, That this House will hear the Cause wherein Captain John Thornhill is Appellant, and Sir Gervas Cliftos and (fn. 1) Mary Clifton Widow are Respondents, on Saturday the First Day of February next, at Ten of the Clock in the Forenoon. Hodie 2a vice lecta est Billa, intituled, "An Act to enable Trustees to sell Part of the Manor of Barkhamstead, and to pay off the Incumbrances charged on the same; and to lay out the Overplus in an Estate, to be settled as the said Manor is now vested." Their Lordships, or any Five of them; to meet on Monday next, at Nine of the Clock in the Forenoon, in the Prince's Lodgings near the House of Peers; and to adjourn as they please. After due Consideration of what was offered thereupon, it is ORDERED and Adjudged, by the Lords Spiritual and Temporal in Parliament assembled, That the said Petition and Appeal of William Watkins, John Watkins, John Pugh, Samuel Watkins, and others, poor Kindred of the said William Penoire, shall be, and is hereby, dismissed this House; and that the Order of Dismission, made in Chancery, the Fourth Day of November, One Thousand Six Hundred Ninety-one, complained of in the said Petition, shall be, and is hereby, affirmed. 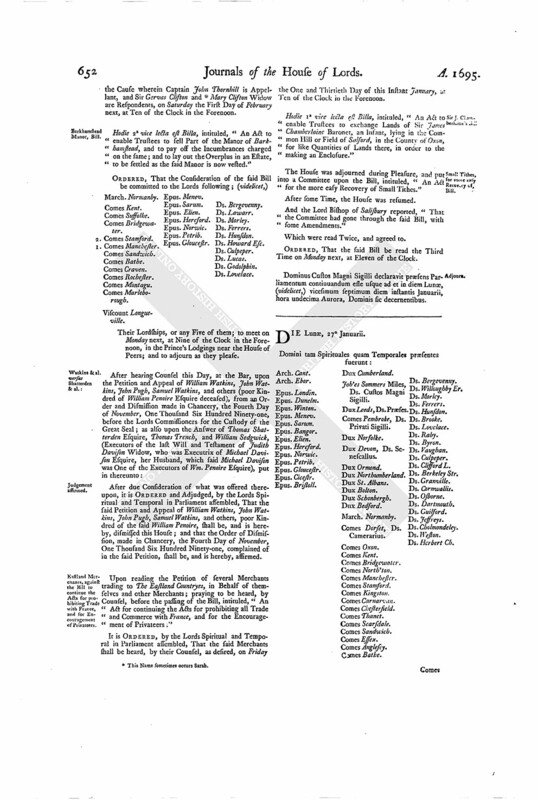 Upon reading the Petition of several Merchants trading to The Eastland Countryes, in Behalf of themselves and other Merchants; praying to be heard, by Counsel, before the passing of the Bill, intituled, "An Act for continuing the Acts for prohibiting all Trade and Commerce with France, and for the Encouragement of Privateers." It is ORDERED, by the Lords Spiritual and Temporal in Parliament assembled, That the said Merchants shall be heard, by their Counsel, as desired, on Friday the One and Thirtieth Day of this Instant January, at Ten of the Clock in the Forenoon. 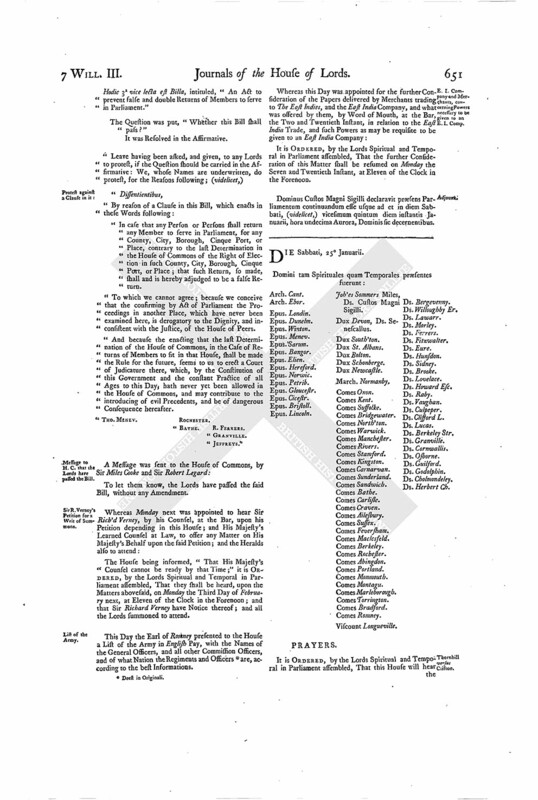 Hodie 1a vice lecta est Billa, intituled, "An Act to enable Trustees to exchange Lands of Sir James Chamberlaine Baronet, an Infant, lying in the Common Hill or Field of Salford, in the County of Oxon, for like Quantities of Lands there, in order to the making an Enclosure." The House was adjourned during Pleasure, and put into a Committee upon the Bill, intituled, "An Act for the more easy Recovery of Small Tithes." And the Lord Bishop of Salisbury reported, "That the Committee had gone through the said Bill, with some Amendments." ORDERED, That the said Bill be read the Third Time on Monday next, at Eleven of the Clock. Dominus Custos Magni Sigilli declaravit præsens Parliamentum continuandum esse usque ad et in diem Lunæ, (videlicet,) vicesimum septimum diem instantis Januarii, hora undecima Aurora, Dominis sic decernentibus.